A fictional account of the sinking of the H.M.H.S. Britannic off the Greek island of Kea in November 1916. This explores the theory of a German Agent sabotaging the liner, a hospital ship. Though its infamous sister ship has received most of the attention over the last ninety-five years, the Britannic met its end in a manner eerily similar to the ship of Titanic. 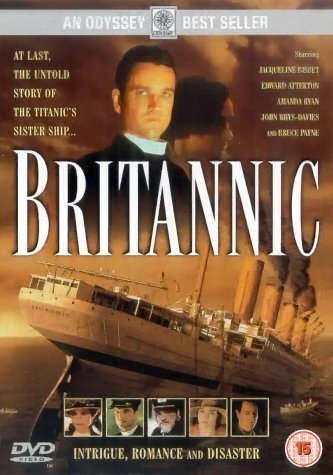 A true story that has remained largely untold, the Britannic was one of largest passenger liners in the world when it sunk, and the circumstances surrounding its demise are just as mysterious as those of the Titanic, as it sustained damage almost identical to that of its sister ship. Though it has never been discovered exactly what caused the Britannic to sink, the film is based on historical evidence and imagines that the liner's demise was the doing of German spies on board the boat. Along with this, the film follows some serious problems that a budding romance between a young Briton and German brings on the couple, as their countries are in the midst of fighting WWI on opposing sides. Britannic, an historical drama, provides the first look of its kind at the little known story of this ill-fated ship. The Britannic's tragic story will never generate the same interest or emotion as that of her more famous sister ship. Still, the Britannic met an even more mysterious fate and does constitute the world's largest shipwreck (the Britannic having been 20 feet longer than Titanic). This brings us to the 2000 made-for-TV movie. Overall, it provided an enjoyable evening's entertainment. It wasn't until near the climax that some disturbing anachronisms and very unlikely character behaviors began to seriously take away from my enjoyment. The film features Amanda Ryan as governess/British intelligence agent Vera Campbell, along with would-be chaplain/German intelligence agent/saboteur Father Reynolds (Edward Atterton). Jacqueline Bisset, as an aging and infirm aristocratic English matron, is the only big name in the cast-and her role is somewhat small. The cast is solid, though, also including John Rhys-Davies as Captain Barrett and Ben Daniels as First Officer Townsend. There is certainly plenty of room for speculation with the Britannic story. Did it hit a mine? Was it torpedoed? Was an internal explosion the primary (or a secondary) cause of the sinking? If so, was it intentional? Was the hospital ship carrying contraband troops (as the real-life Germans seemed to believe) or a cache of weapons (as the movie Germans rightly believed)? These are all fair questions and any halfway feasible explanation is about as good as another. Therefore I had no trouble with the basic premise of a German spy on board and a German U-boat being involved-although the film shows the U-boat failing to sink the ship and then being destroyed by a British warship-something that did not happen.